House situated between orange and lemons square 170metros, WIFI, on a plot of 5 thousand square meters, with parking for at least four cars, two hundred meters lawn area, private pool, patio, barbecue, table and deck chairs for outdoor , washing machine, kitchen (laba dishes, toaster, blender, cutlery dishes ...), towels, sheets and comforters are supplied. Wonderful views from the bedrooms and other rooms of the house. Cot, TV, DVD player. Large dining room with extendable dining table for up to 8 people, and two sofas. Also cradle. toilet, combination tub/shower, Doble aseo, con vistas. The necessary bath and pool towels will be dispensed. We simply loved the farm. Juan is just an amazing host. We spent two great weeks at his farm and we have been planning to come back while still there. The house is very comfortable with its three bedrooms and two bathrooms, large living area, well equipped kitchen and beautiful garden and outside seating. Nearby town was very well accessible by a short walk through the countryside and the coast by a short drive through the mountains with amazing vistas. We will definitely be back! My partner and I, and two toddlers, stayed here for two weeks in September/October 2011. The owner, Juan, is very helpful in terms of organising the stay, and his relative, Ana Maria, who is on hand close to the property, is very kind and helpful. 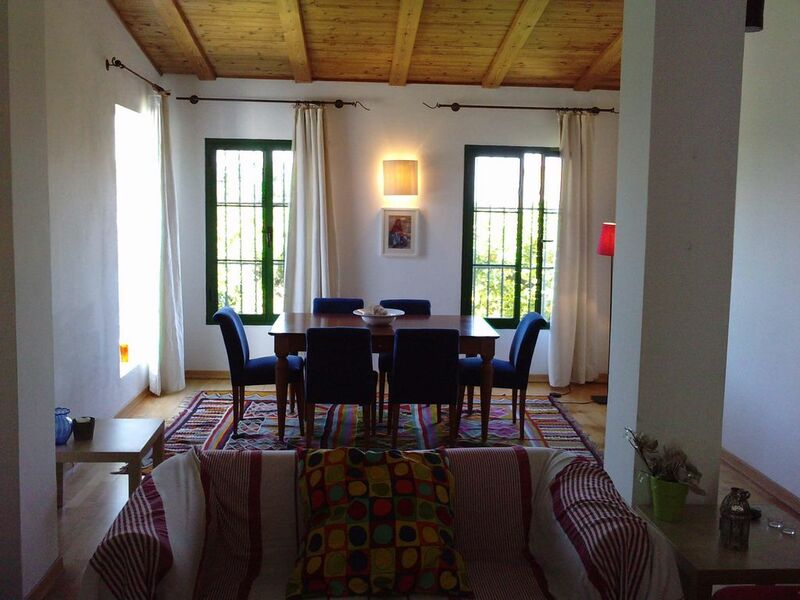 The house is beautiful and nicely situated for getting some space, but very near Alhaurin (10 min walk / 5 min drive) and also only about 30 mins drive from the beach if you get cabin fever. The interior is well designed, and has a big open downstairs space, and the upstairs bedroom / en-suite is massive. The orchard of Orange Trees on every side of the house is sufficiently large that you have total privacy. We would very much consider going back as it's great to find a house that is not at all naff (naffness in design and aesthetics seems to rue in Spain!) in such a perfect spacious location. You are just a few mins drive from the hills above the house, too, where you can walk untroubled through the Corsican pines. Thanks, Juan de la Rosa! Ein sehr gemütliches Haus mit idyllischem Garten. Alles vorhanden was man braucht. Juan, der Vermieter, ist ein Herzchen dem es sehr wichtig ist, dass seine Gäste einen wundervollen Urlaub genießen. Wir kommen definitiv wieder. Vosotros sois una encantadora familia, el mundo es mas bonito con personas como vosotros. Por las noches, ruido de los perros que ladran porque los duenos dejan sus perritos afuera!! Lastima..
Hola, me parece injusto su comentario sobre el ruido de los perros, le explico: en primer lugar usted sabe que no tengo animales en mi propiedad y en segundo lugar yo he dormido esta noche en la propiedad ( noche del 6 al 7 de septiembre 2018) y le prometo que no he escuchado ladridos de perros. Un cordial saludo El Propietario. Superbe vacances dans une région magnifique!!! La maison est très agréable à vivre et conforme à la description. Les extérieurs sont joliment aménagés et fleuris d'une grande diversité de plantes. Nous avons pu visiter Grenade, Seville, Cordoue, et Tarifa car l'emplacement est assez central. Nous avons fait la connaissance de Juan et Mounia avec qui nous avons noué une relation d'amitié. Juan parle admirablement bien français ce qui simplifie beaucoup les choses. Tout était parfait. C'était un réel plaisir de vous connaître tous les quatre et de bavarder avec vous. J'espère que c'est le début d'une amitié. Merci infiniment Sophie pour le livre que je suis entrain de lire et pour ton sacrifice de n'avoir pu le lire pendant tes vacances. House situated between lemons, oranges and vegetable crops at the foot of the north face of the Sierra de Mijas, a 5-minute drive from both courses, 30 minutes from Marbella, 20 minutes from Fuengirola, 30 minutes from Mijas, 25 minutes from Malaga airport and city railway station. Also an 8-minute walk from the bus connection that will connect us with all the above sites. Los precios son por semana, en Euros, desde un sábado a las 16h hasta el siguiente sábado a las 12h, con elasticidad de entrada y salida previo acuerdo. No se permiten mascotas. Precio de reserva: 30% al reservar. Balance del pago: 10 días antes de llegar. Depósito de garantía reembolsable: 300 €. Método de pago aceptado: transferencia bancaria.